Scuba diving with Dive Provo. Diving the Thunderdome wreck site. 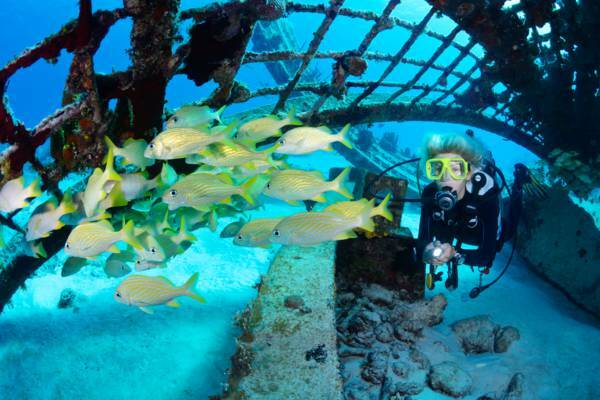 Dive Provo is a PADI 5 star dive centre and one of the oldest dive shops in the Turks and Caicos. The dive shop operates three modern and fully equipped Newton dive boats, which offer a comfortable ride out to the beautiful reefs that surround Providenciales. Dive Provo has a reservations and gift shop at Ports of Call plaza in the heart of Grace Bay, and operates out of two marinas on Providenciales, for ease of access to the best dive sites. 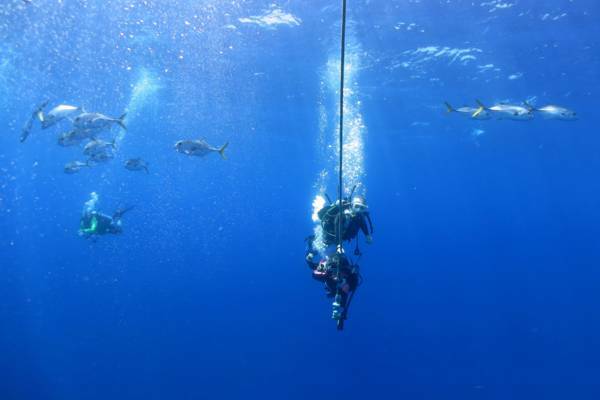 Choose from one, two and three tank dives. 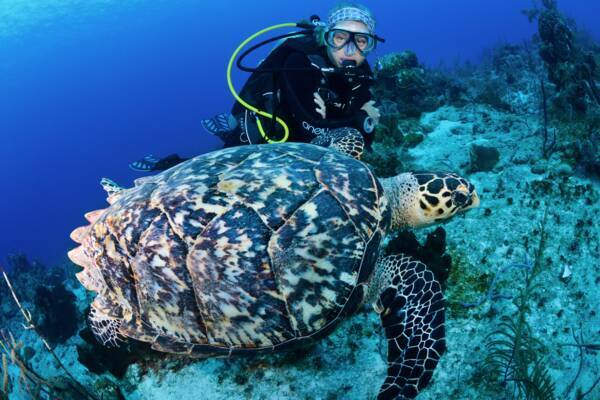 Dive spots include amazing sites across the western Caicos Islands, including Grace Bay, Pine Cay, Northwest Point, Sandbore Channel, West Caicos, and French Cay. Hotel pickup is typically included. Even the safety stops offer interesting sightings! Professional instruction has always been important with Dive Provo. Their wide offering of certifications and courses, the best selection on the island, is a testament to the fact. Dive Provo is a PADI 5 star dive shop, with a menu of certified PADI courses including Discover Scuba Diving (DSD), Open Water, Advanced Open Water, Nitrox, Rescue Diver, and more. Many PADI dive courses have two counterparts to a course: the theory and technical side, and the practical instruction. Most courses have the option of learning the theory portion of the course online, so you won’t have to spend your vacation days in the classroom. The eLearning courses can be completed before arriving in the Turks and Caicos, or in the evenings after the day’s activities. Dive Provo’s expert staff have experience from top dive locations around the world including the Bahamas, much of the Caribbean, Thailand, the Philippines, and the Mediterranean. 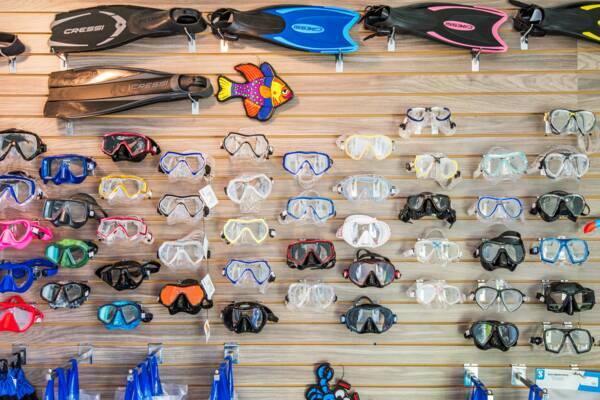 Dive Provo offers a great selection of masks for scuba diving, snorkelling, and freediving. Dive Provo’s shop at Ports of Call in Grace Bay stocks one of the best collections of snorkel gear in the Turks and Caicos. When shopping for masks and fins, it’s great to have a wide selection and expert advice, as properly-fitting equipment makes a great difference in how enjoyable snorkelling can be. Simply put, the right gear just works. Your mask won’t continually leak, everything is comfortable, and it last longer too. The shop also carries a range of miscellaneous small accessories for diving, T shirts, jewellery and pendants, and other gifts. The Provo Challenger, one of the Dive Provo fleet.